Littlest Sweet Shop: Freshly baked BREAD! Here is a mini mid-week update! I've taken some new shots of Littlest Sweet Shop bread alongside some new ones. As promised, the new maid (Naru) in action! 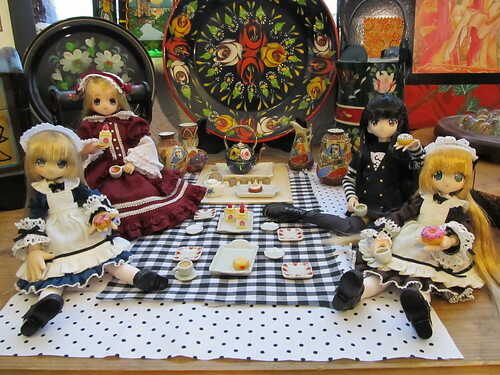 I'm totally smitten with these Sweets à la mode dolls from Azone. I've just purchased another one (OMG!) and she will probably arrive hopefully by Valentine's Day. My plan is just to get just one girl from each pair they release since they cost a lot of £££s. Naru is a Pureneemo Chocomint Lycee doll. She loves serving ice-cream! My recent commission was to cater a tea party picnic. 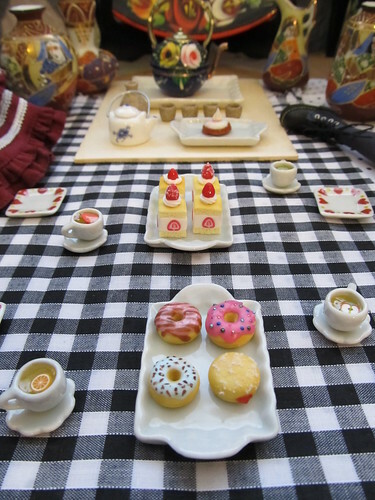 The clients were Pureneemo XS and Picco Neemo dolls so the doughnuts were done in 1/8th scale which was a perfect size for them. Since most of Littlest Sweet Shop items are hand-modelled - sizing of the food can be customised. OK, that's all for now! I will be quite busy with a big commission this whole month so please submit a commission request early if you would like some treats for your dollhouse/dolls/dioramas/etc.